The Dow Jones Industrial Average and S&P 500 closed lower on Monday as shares of big banks fell broadly. Worries about a deluge of corporate earnings reports coming this week and rising geopolitical tensions also dampened investor sentiment. The 30-stock Dow fell 126.93 points to 25,317.41, led by losses in Goldman Sachs. The S&P 500 pulled back 0.4 percent to 2,755.88 as the financials sector dropped 2.1 percent. 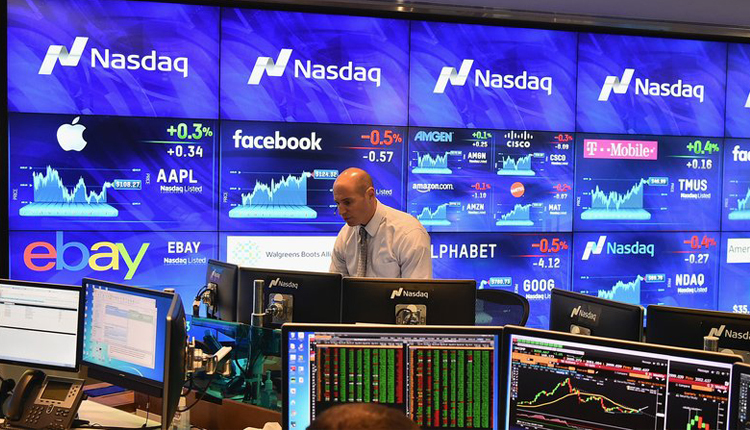 The Nasdaq Composite, however, gained 0.3 percent to close at 7,468.36 as Amazon and Apple rose 1.4 percent and 0.6 percent, respectively. Monday also marked the fourth straight day of losses for the S&P 500, while the Nasdaq snapped a three-day slide. Bank of America and Citigroup both fell more than 3 percent. J.P. Morgan Chase and Goldman Sachs closed 1.4 percent and 2.4 percent lower, respectively. The SPDR S&P Bank ETF (KBE) fell 2.8 percent, posting its worst day since Oct. 10, when it pulled back 3.1 percent. Banks fell broadly amid worries that higher mortgage rates would cap loan growth. Wall Street is trying to rebound from steep losses this month. The major indexes are all down at least 4.3 percent through Monday’s close amid fears of rising interest rates and a slowdown in the global economy. Halliburton and offroad vehicle maker Polaris Industries both reported better-than-expected earnings before the bell Monday. Kimberly-Clark also posted a stronger-than-forecast profit. Several other companies are scheduled to report earnings this week, including Dow members 3M, McDonald’s, Caterpillar and United Technologies. Amazon and Alphabet are also set to report this week. The current earnings season is off to a good start thus far. According to data from FactSet, 82 percent of the S&P 500 companies that have posted earnings have topped expectations. However, “there are challenges that we face now,” including rising interest rates, the midterm elections and U.S.-China trade tensions, said Jeremy Siegel, a longtime stock bull and professor at the Wharton School. “I’m looking flattish” for the coming year, he added. Investors are also grappling with increasing geopolitical tensions. A Saudi official provided this weekend a new account of the death of journalist Jamal Khashoggi. In it, the official says a team of 15 Saudi nationals was sent to confront Khashoggi and threatened to drug and kidnap him. Khashoggi was then killed in a chokehold when he resisted. This deviates from a prior official statement from Saudi Arabia, which said Khashoggi died in a fistfight at the Saudi consulate in Instanbul. Khashoggi’s death has led to global criticism toward Saudi Arabia and has sent ripple effects throughout global markets. Last week, foreign investors reportedly dumped more than $1 billion worth of Saudi stocks. The Shanghai Composite rose more than 4 percent to notch its best day since March 2, 2016. The sharp move higher comes after Chinese authorities pledged to support China’s economy and offset the negative impact of U.S. tariffs. They made that pledge after reporting weaker-than-expected economic growth for the third quarter. Chinese stocks are still down sharply this year despite Monday’s jump. The Shanghai Composite has plummeted about 20 percent in 2018 and is down 21.4 percent over the past year.